Tis the season to be jolly! Below are several holiday-oriented signs and word lists to help celebrate (or at least communicate about) the holidays in sign. We WISH you many BLESSINGS this HOLIDAY SEASON, including HEALTH, HAPPINESS, time spent with FAMILY and FRIENDS, and PEACE, LOVE, and JOY. Have you been NAUGHTY or NICE this year? Make sure to hang your STOCKINGS and put out MILK and COOKIES for SANTA CLAUS. CHRISTMAS is the celebration of the BIRTH of JESUS and the close of ADVENT. ANGELS proclaim him a savior and SHEPHERDS came to adore him. WISE MEN followed a STAR to BETHLEHEM to bring Jesus GIFTS. The EIGHT DAY festival of CHANUKAH, also know as the FESTIVAL of LIGHTS, COMMEMORATES the MIRACLE of OIL by lighting CANDLES. Kwanzaa is a WEEK long HOLIDAY HONORING AFRICAN HERITAGE and AFRICAN AMERICAN CULTURE. It is a CELEBRATION of FAMILY, COMMUNITY, and CULTURE. With Signing Savvy membership you can create your own custom word lists (and practice them with flash cards and quizzes), so if we don’t have a pre-built word list exactly how you want it, you can build your own. Attention boys and ghouls! In the spirit of Fall and Halloween, learn about why pumpkins are a superfood in this WonderGrove Kids animation featuring sign language from Signing Savvy. WonderGrove Kids animated lessons with sign language are specifically designed for helping Pre-K, Kindergarten, First Grade, and Second Grade kids. 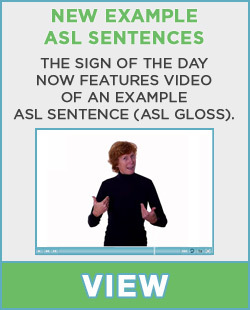 The animations are a fun way to learn and practice sign language vocabulary, while specifically designed to fit well with an Early Childhood Curriculum - they are perfect for daily use in the home or classroom. Find our more about the animations and the WonderGrove Kids program. Yesterday (Sunday, September 29) was International Day of the Deaf and the end of Deaf Awareness Week. Deaf Awareness Week, also called International Week of the Deaf (IWD), is celebrated annually and ends with International Day of the Deaf. Deaf Awareness Week is celebrated by national and regional associations of the deaf, local communities, and individuals worldwide. In Kokomo, Indiana: Students at Indiana University Kokomo organized a "Silent lunch" at Cougar Country Café where volunteers handed out ear plugs and asked patrons to communicate, but not speak. Food orders were made by circling orders on printed menus and writing messages on dry erase boards. The ASL manual alphabet was printed on placards on each table to encourage fingerspelling and sign language. In Mt. Pleasant, Michigan: Comedian Keith Wann performed his unique comedy routine combining American Sign Language storytelling and spoken English at Central Michigan University. Wann, a Child of Deaf Adults (CODA), highlighted funny misunderstandings that can occur between hearing and deaf communities. Share what you did during Deaf Awareness Week by leaving a comment below or telling us on our Facebook Page.